Used for medium level missile spells. Death runes are one of the runes used to cast spells in the Magic skill. They are required to cast medium-level missile spells. Members with 65 Runecrafting and who have completed Mourning's Ends Part II can craft death runes at the death altar by using pure essence on it, with each essence yielding one death rune. Each death rune yields 10 runecrafting experience. Players with 99 Runecrafting will always craft two death runes per essence. Several monsters, such as ankous, nechryaels, and dark beasts, commonly drop death runes. Death runes can also be bought from all Magic shops with a stock of 250, except for the shop on Ape Atoll. They can be found in the Barrows Chest with at least 631 rewards potential. Death runes can also be dropped by any monster which has access to the rare drop table. The spells that require death rune to cast are shown below. A cat can be given to a civilian in West Ardougne in exchange for 100 death runes (200 with Ardougne's easy diary completed). Kittens and Lazy cats will not work. An Overgrown Cat is fine. Death runes in Barbarian Assault alch for 0 coins. ↑ Jagex. Mod Kieren's Twitter account. 3 Mar 2016. 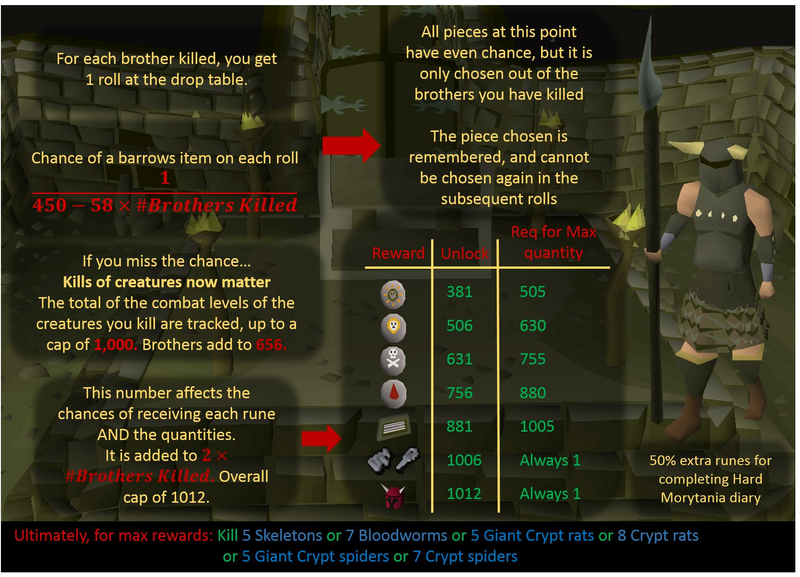 Mod Kieren: "You guys wanted info on Barrows loot, here it is... Full size:  Explained the best I can!"